One of the worst ever interfaces i have ever come across is that of Rakuten LinkShare. Even before they’ve been bought by Japanese giant Rakuten it was bad, and it hasn’t been improved since I’ve signed up with them in 2008. 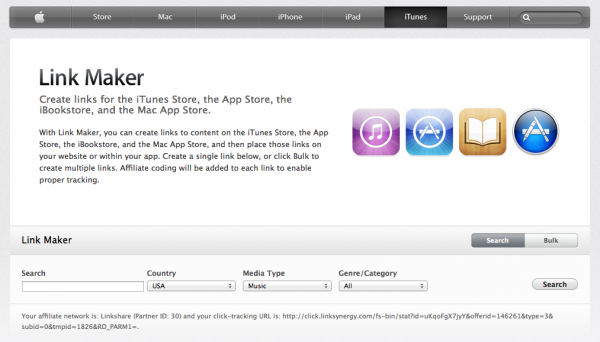 Lucky for us we don’t have to use their interface to get links to iTunes Products – we can use the standard good looking and well working iTunes Link Maker. All we need is go there via LinkShare, which will embed our affiliate code. 3.) Click on “US iTunes, App Store, iBookstore, and Mac App Store” (you need to be subscribed and approved for this option to become available). 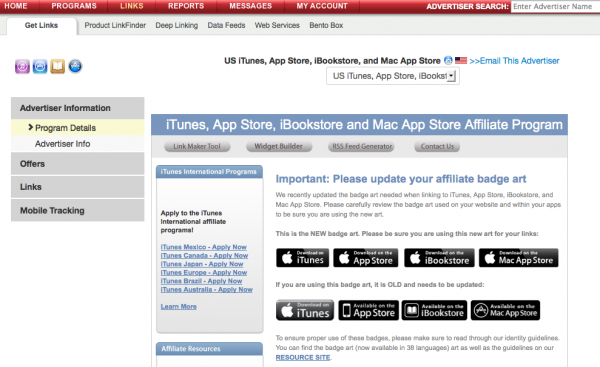 Note the message that reads: “Your affiliate Network is…” – this is the confirmation that you’re building links as an affiliate. If that message isn’t there, your links are not tracked. Instead if LinkShare, this can be a different partner (TradeDoubler is another one for example). Now you can enter a product and grab the link, which will already contain your affiliate ID.